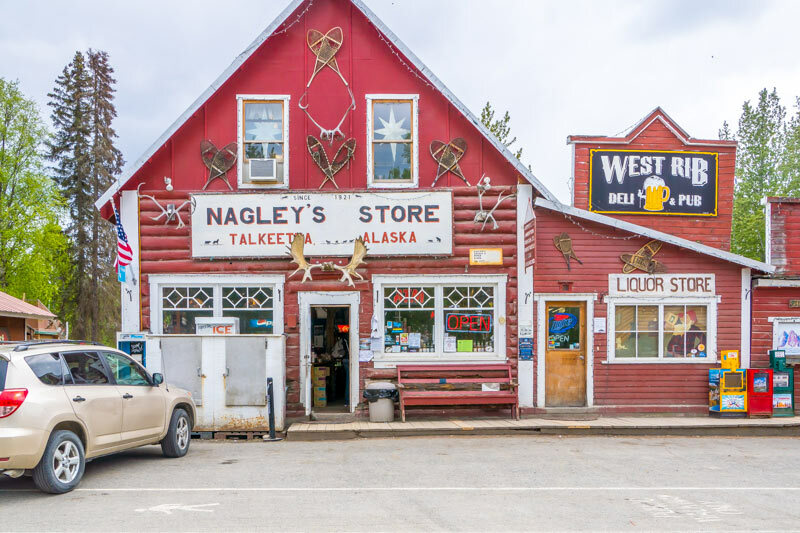 Located about 4.5-hours south of Fairbanks, Talkeetna is off the radar of many Alaska visitors. Granted it’s well known as the staging area for climbers who attempt to scale Mt. Denali; however it’s also filled with galleries, shops and a few unique restaurants. The train from Anchorage to Fairbanks stops there, and the hamlet is certainly easy to find on just about any map. Factor in a population of just 876, and you have a site that absolutely screams “small town Alaska”. It’s definitely a doable — and highly recommended — add-on to any Denali National Park visit. Although it’s off-the-beaten-path, Talkeetna still has daily train service from Anchorage and Fairbanks. There’s not much to the station — just a platform — but there’s a portable lift available for access to the rail cars. Even better — accessible service is available in both classes on Alaska Railroad. Alternatively you can drive to Talkeetna. From the George Parks Highway, take the Talkeetna Spur turnoff, and continue along for about 14 miles to the end of the road. You literally can’t miss it!. Accessible street parking is available near Main Street and Talkeetna, just across from Nagley’s General Store; and accessible restrooms are located in the adjacent park. There’s level street access throughout the three-block historic district, but some of the buildings — like Nagley’s General Store — have a step or two up to them. That said there’s certainly no shortage of businesses that have accessible entrances, including Bearfoot Bens, Talkeetna Gifts & Collectables, Heritage Alaska and Kahiltina Bistro. Of course you can also just wander around and check-out the architecture of this town, which served as the regional construction headquarters for Alaska Railway in 1916. And if you see a grey Persian cat sauntering up and down Main Street, stop and say hello, as it’s most likely Denali, the town’s newest mayor. He tends to hang out near Nagley’s or around the corner at the West Rib Café and Pub. Located about an hour from Talkeetna in Denali State Park, the Mt. McKinley Princess Wilderness Lodge (www.princesslodges.com/princess-alaska-lodges/mckinley-lodge/) is the perfect lodging choice for a Talkeetna visit. Even if you lack transportation, a wheelchair-accessible shuttle to and from Talkeetna is available upon request. The lodge itself boasts excellent access, with plenty of accessible parking and barrier-free access to the main lodge. Inside the main lodge building there’s good access to the North Fork Restaurant, the Base Camp Bar (don’t miss the deck view), the Coffee Bruin Espresso Bar, the gift shop and the front desk. There’s also barrier-free access and wheelchair seating available in the nearby Hudson Theater, which features a grand production of the aurora borealis set to music. The 20,320 Alaskan Grill, which is also close to the main lodge building, offers equally good access, and includes a menu filled with Alaskan favorites. And if you can’t manage the walk to these — or any — places, a wheelchair-accessible on-property shuttle is available to all guests. 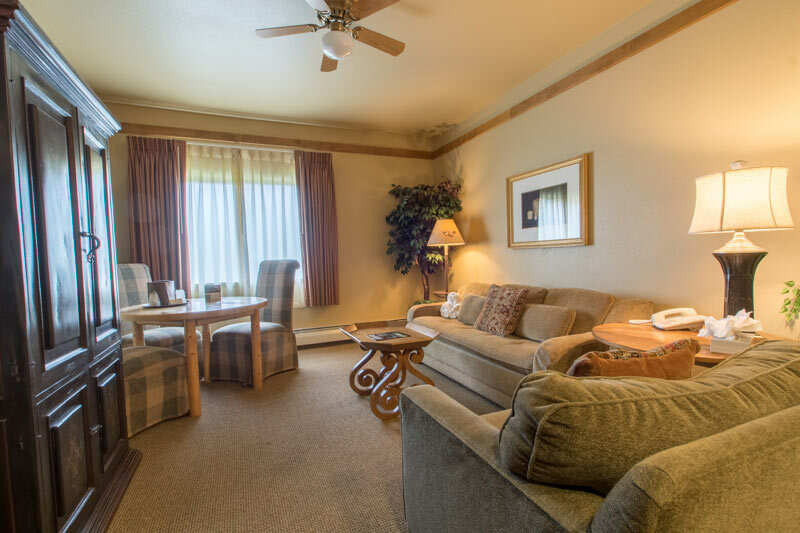 This property boasts a variety of accessible guest rooms in 22 buildings that are scattered throughout the wooded grounds. All of the accessible rooms have wide doorways, good pathway access and lowered clothing rods. 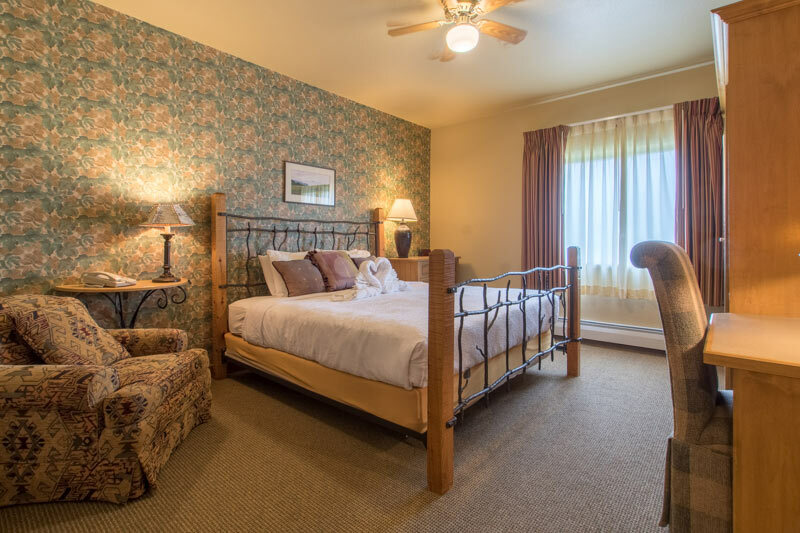 Room 111, which is located close to the main lodge in Building 1, is furnished with a 22 inch high queen-sized bed and a twin bed, with an access aisle between them. Other furnishings include a table with two chairs and a chest of drawers. 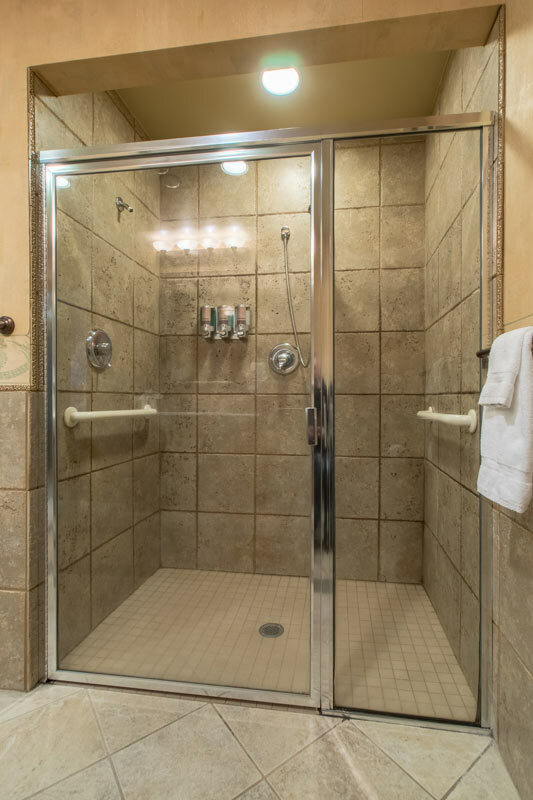 The spacious bathroom includes a roll-in shower with a fold-down shower bench, grab bars and a hand-held showerhead. 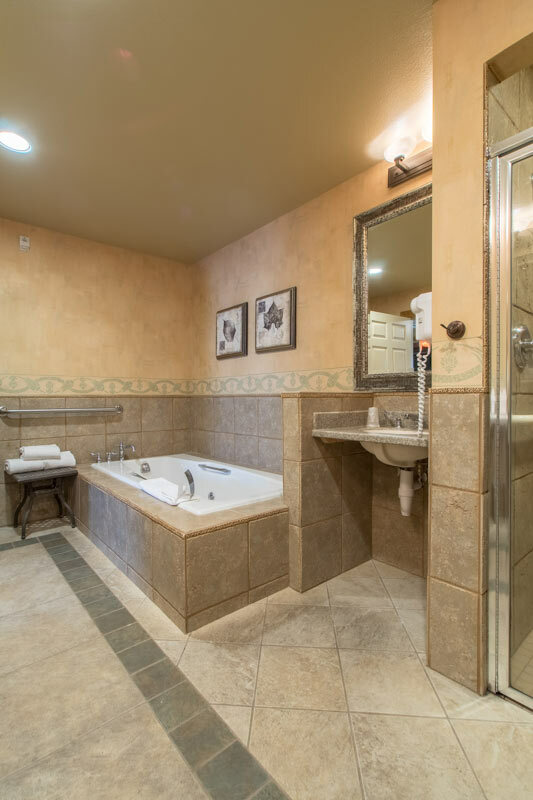 Round it out with a roll-under sink and a set of toilet grab bars on the back and right walls (as seated), and you have a very accessible space. If you’d prefer an accessible suite, Room 1903 is a very good — and spacious — choice. The bedroom includes a 25-inch high king-sized bed with wheelchair access on both sides, a desk and a chair, and a chest of drawers. 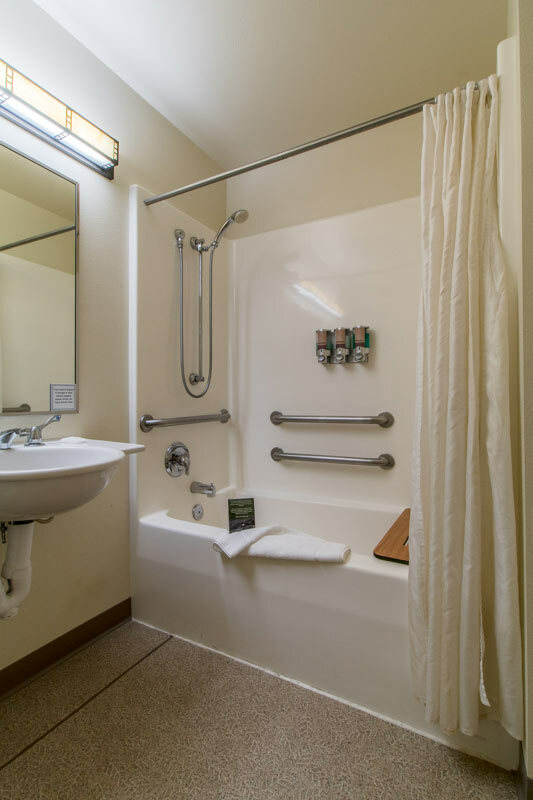 The adjacent bathroom is equipped with a roll-in shower with grab bars and a hand-held showerhead; as well as a jetted tub with a grab bar. 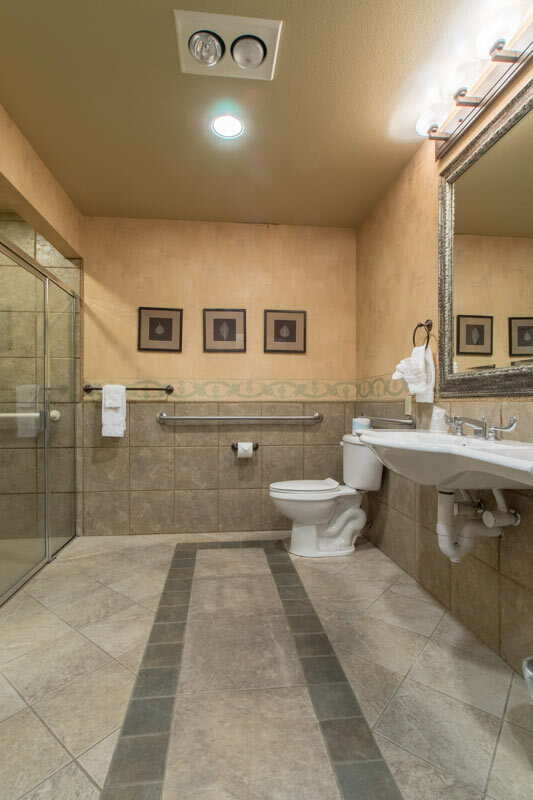 The toilet grab bars are located on the back and right walls (as seated), and the bathroom also has a roll-under sink. This suite includes a 14-inch high sleeper sofa in the living room, along with a dining table and chairs, an easy chair and a coffee table. 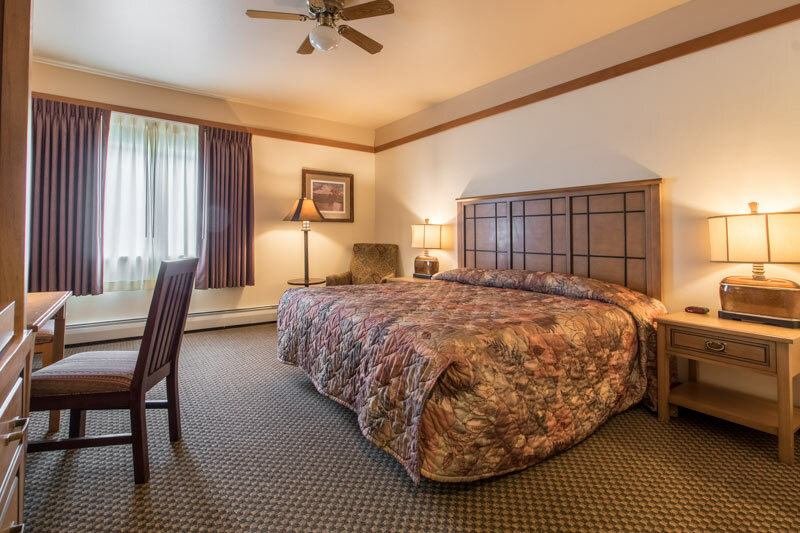 This room is perfectly suited for a small family or for someone traveling with an attendant. 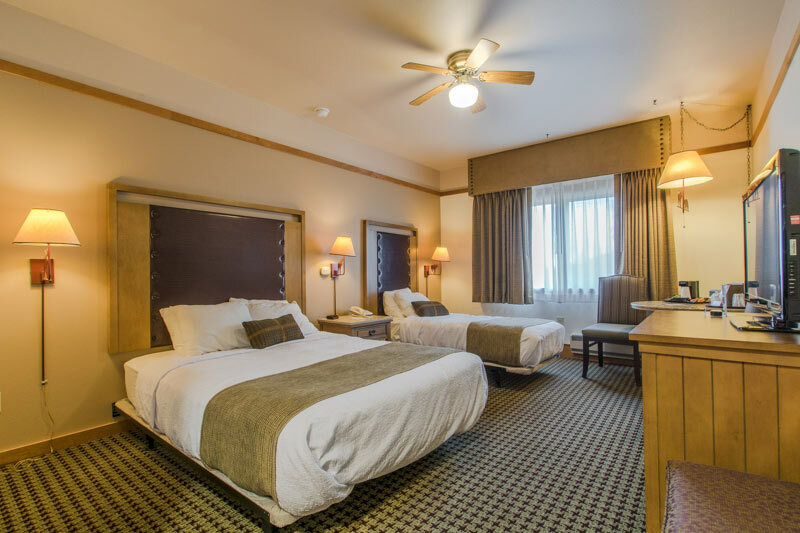 Last but not least, room 2502 is furnished with a king-sized bed with wheelchair access on both sides. 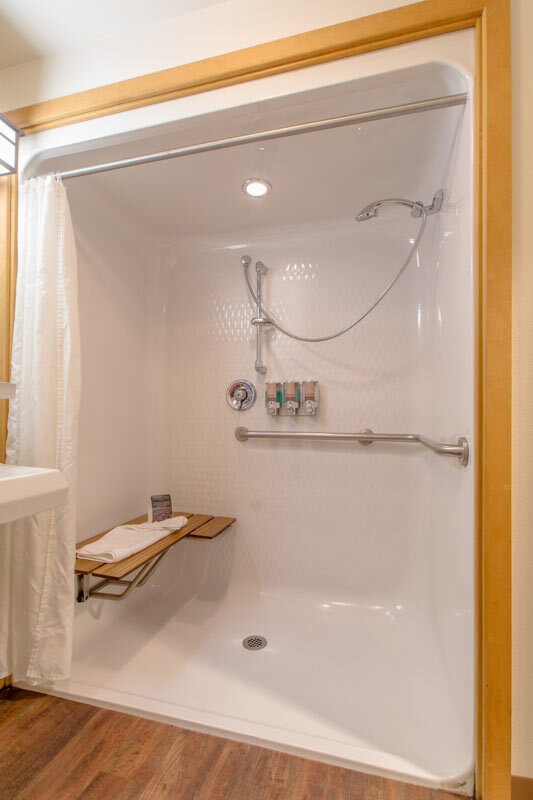 The bathroom is outfitted with a tub/shower combination with grab bars, a hand-held showerhead and a fold-down bench on the far end of the tub. 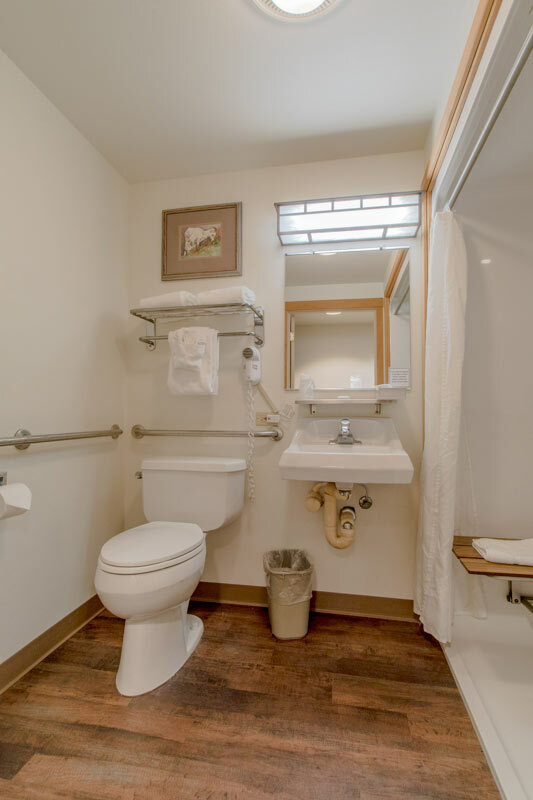 The toilet grab bars are located on the right and back walls (as seated), and the bathroom also includes a roll-under sink. 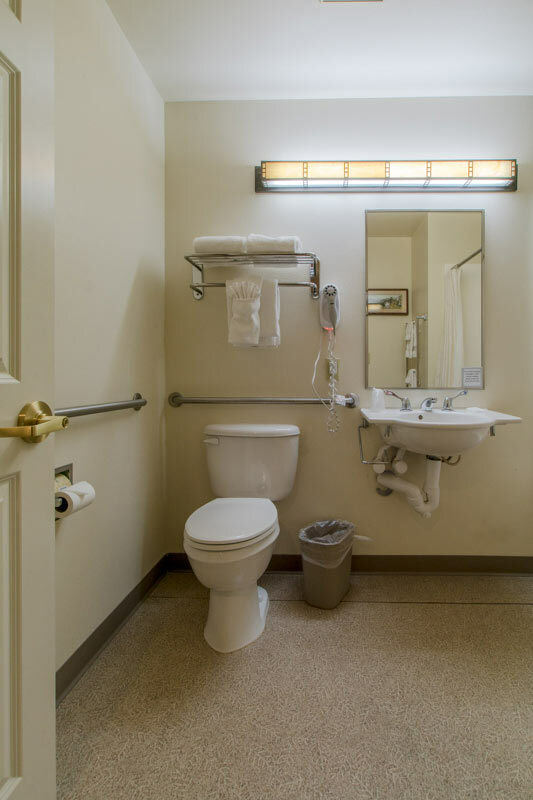 The housekeeping closet has toilet seat riser, shower chairs and shower benches that can be used in any room, upon request. A limited number of medical refrigerators are available, and refrigerated medicine can also be stored at the front desk. Additionally, all employees receive training in disability etiquette and awareness. Bottom line — the the Mt. McKinley Princess Wilderness Lodge is a very welcoming and accessible place to stay, so make sure and add it to your next Alaska itinerary. ‹ Flying with IV Supplies	› Denali National Park — It’s More Accessible Than You Think!